My middle boys turns 13 this year! 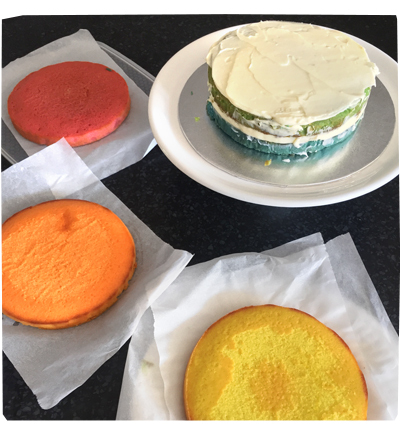 In a fit of madness – and let’s be honest, mummy-guilt mixed with a bit of creative boredom – I decided to embark on a bit of birthday cake craziness. We were hosting 30 people for dinner the following day and I just couldn’t bear to make yet another chocolate cake. So boring! I took that for a YES and ran with it. I researched different kinds of cakes, as I’ve only made chocolate cakes, and I decided on this recipe for a White Chocolate Mud Cake and I reduced the sugar. I needed to make 2 cake mixtures from this recipe and divide the batches into 5 portions. My cake tins were 18cm in diameter. Apologies for the crappy photos, I wasn’t planning to share my kitchen counter clutter, but it looked too funny not to share. I tried to use as little food colouring as possible. Just enough so people could get recognise what colour it was supposed to be. 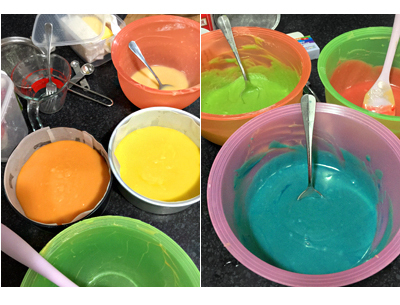 My coloured bowls are a bit distracting, because really the cake mix turned out very pale. I baked 2 cakes at a time, and 1 cake by itself. I took the last cake out of the oven at 12 midnight. I let them cool for 30 minutes, wrapped them up and put them in the fridge. The cakes turned out to be fantastic. They were dense, solid, yet moist. This recipe is definitely a keeper! Did I mention I was cooking for 30 people too? The next day, after I did all the cooking, it was time to ice the cake. I made a cream cheese icing that found on another site – I don’t recommend it. It was sticky, glossy, hard to work with and tasted too sweet. Hence my cake leaned over slightly! 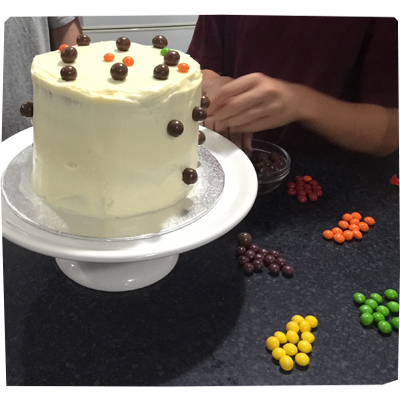 I got my 13 year old to decorate the cake, so he could feel like he had some connection to the whole process? 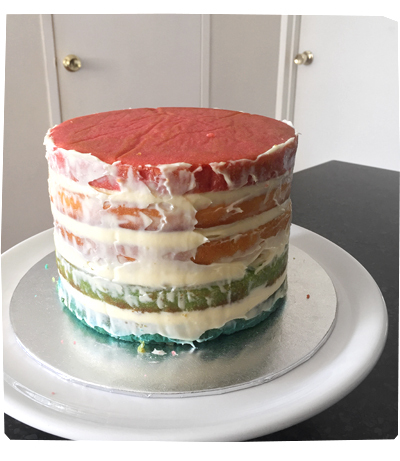 Ta da – my first rainbow cake! It was so cute. Like I said, the only reason it turned out so well was because of the cake recipe. It was lovely, dense, moist and not overbearingly sweet. It was easy to cut, it held together and it didn’t fall to bits. It presented very nicely too! 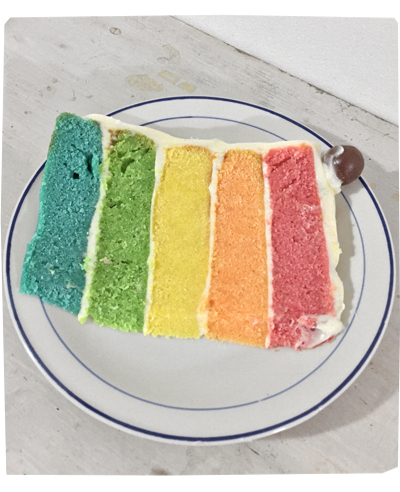 Because the cake was so tall, I cut the slices into 1cm – 2cm thickness, like I said, it held together really well. My only criticism was that it had a very plain taste. The sweetness was just right, but it just tasted like a sweet milky cake. So I would put flavouring in there some how. Maybe passionfruit? Here’s the recipe! Original amount of sugar was 165g but I reduced it to 130g. Preheat oven to 160C. Grease an 18cm round pan and line the base and sides with baking paper. Weigh your bowls and take note. Place flour in a large bowl, add one cup of chocolate mixture and stir until a smooth paste forms. I made 2 separate cake batches and divided into 5 portions. Add food colouring. 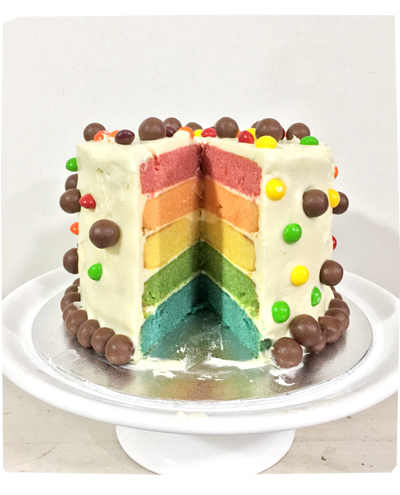 Bake for 30 minutes, until a knife inserted into the center of the cake comes out clean. Allow cake to cool on a wire rack to room temperature. Store cake in an airtight container in the refrigerator. *Sorry I don’t have a good recipe for icing the cakes!